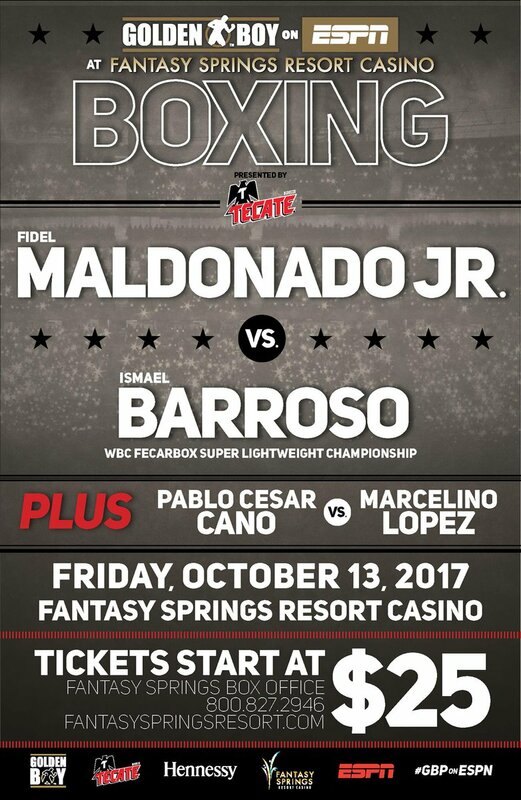 With New Mexico’s best boxer Austin Trout fighting for a world title on Saturday night in Brooklyn, New York, looking to not be outdone is New Mexico’s second best boxer Fidel Maldonado Jr. who will be in action tonight on ESPN Deportes and ESPN 3. Yesterday, Maldonado (24-3-1, 19KOs) and Ismael Barroso (19-1-2, 18KOs) weighed in for their “Golden Boy on ESPN” main even bout in Indio, California. The two men will vie for the WBC FECARBOX Super Lightweight championship. Earning the title is a big step to being ranked in the highly coveted top 15 WBC rankings. Maldonado weighed in right at the weight class limit of 140lb. while Barroso tipped the scales at 139lb. The action takes place at the Fantasy Springs Casino in Indio, California with the co-main and main events airing on ESPN Deportes and ESPN 3 at 8pmMT/10pmET.